The concept of Rosemary Jenkinson’s new play May The Road Rise Up was first mooted this day last year, her first day in post as Writer in Residence at the Lyric Theatre in Belfast. “It was a great year, and totally unexpected” says Jenkinson. Since last January, her “roller coaster ride” has included her play Lives in Translation about the disempowering asylum system being been produced by Kabosh as part of Belfast International Arts Festival (it’s coming back in 2018) and a series of satirical Michelle and Arlene rapid response plays produced by Accidental Theatre documenting two local political leaders’ fine foemance as well as a festive special looking at Trump’s Big Bad Belfast Christmas by C21 Theatre. 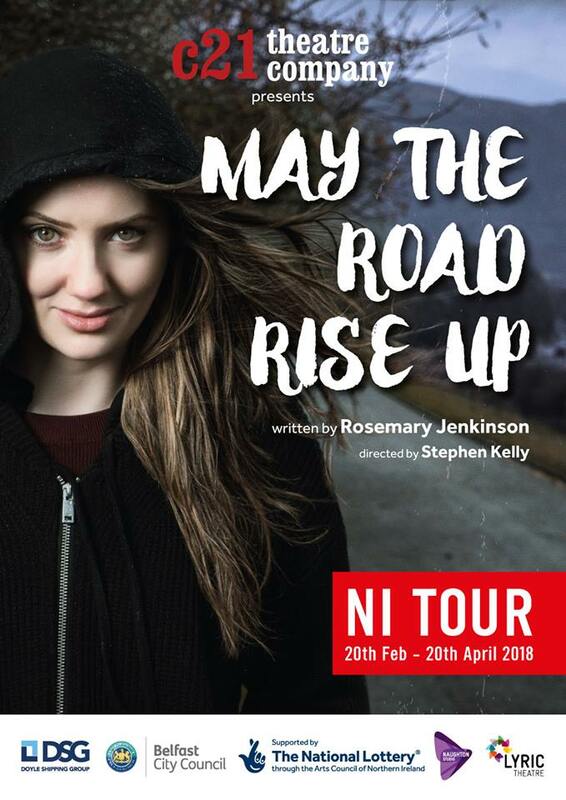 May The Road Rise Up is a dark comedy telling the story of Mia, an East Belfast woman who freewheels through life, having fun in spite of the challenges she faces. She loses her boyfriend, loses her credit balance, loses her job, yet never quite loses her sense of humour. Jenkinson describes the work as “a kinetic kaleidoscope of the society we’re in”. At the start of the play, Mia is making ends meet by driving a supermarket delivery van around Belfast, surgically analysing the families into whose houses she lugs their groceries and drink. The script reads like Trainspotting meets I, Daniel Blake. There are wild parties and shenanigans in East Belfast in tandem with debt, prescription drugs and disability. The play is written to be “a one person road movie … about a woman who seizes life before life seizes her” says Jenkinson. A one woman show is “a more personal way of writing a play, more emotionally direct and a faster way to reveal ideas than using dialogue”. “You’re in her head space. She’s very spontaneous, leaping from one event to another. It’s fast paced and you certainly won’t be bored.” Through hearing her thoughts and recollections rather than dialogue between characters, Jenkinson feels that the audience get a better insight into her motives. Thrilled to be working again with C21 Theatre – who are “always great to work with” and “a lot of fun” – Jenkinson says that at the auditions actor Christine Clare stood out as someone with “the verbal drive to make the character really engaging”. In the past some of Jenkinson’s scripts have been inspired by people she knew who were working in a particular industry or experiencing a particular problem. With May The Road Rise Up, there’s an autobiographical element to the plot, capturing Jenkinson’s own experience of trying to claim Employment and Support Allowance (if you can't work because of illness or disability). On top of her anger at the unfairness of the social security system is layered Jenkinson’s awareness of the effect of taking prescription drugs. “Your life drifts when you’re on prescription drugs” and that’s part of the fictional Mia’s experience. “They fog up your brain and make you not do things and not get on with things” and it takes a long time to reduce the dosage and finally get off them. May The Road Rise Up hits the stage of The Lyric Theatre from 20-24 February before embarking on an NI tour through Marketplace Theatre, Armagh (Thursday 1 March), Sean Holywood Arts Centre, Newry (Friday 2), The Strand Arts Centre, Belfast (Thursday 8), The Courtyard Theatre, Newtownabbey (Friday 9), Island Arts Centre, Lisburn (Saturday 10), The Alley Theatre, Strabane (Thursday 19 April) and Down Arts Centre, Downpatrick (Friday 20).